School science fairs give children the opportunity to put scientific concepts and principles to the test. By applying the science facts they’ve learned throughout the school year, they can create fun and interesting projects that will demonstrate some of the laws of nature. Regardless of whether you’re an educator searching for ideas for your students or a parent looking for inspiration for your child, the Gynzy tools and activities listed below are certain to get you off to the right start. This Floating and Sinking activity for your interactive whiteboard can be used with or without a smart board. Children have the opportunity to select objects from the top of the screen to drop into the water. The chosen object will either float or sink. Help your children understand the principles behind why these objects float or sink. Talk about buoyancy, the different materials each item is made from, how weight affects the outcome, and hollow versus solid objects. Then, using the information you have received from the Gynzy activity, help your student or child design their own experiment using the principles they’ve learned. As they apply these concepts to their own hands-on experiment, they will not only be able to predict which objects will float and which will sink, they will also be able to explain why this is true for each. This experiment can range in difficulty and detail depending on the grade level of your student. Allow children to select items to experiment with from your home or classroom that they haven’t tried on the screen. This will give them an opportunity to reinforce the concepts they’ve learned as they apply them to new objects. 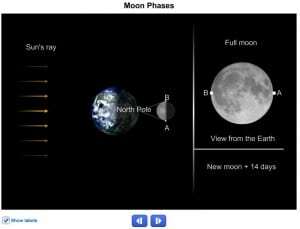 Help your kids understand more about the moon’s rotation around the earth and the earth’s rotation around the sun by showing them this interactive tool. The Moon Phases activity is an animation that allows students to watch the different lunar phases as they relate to the moon’s position in regards to the earth and sun. As the moon makes its monthly journey from the sun-side of the earth to the opposite non-sun side, the amount of visible lunar surface changes from completely dark (new moon) to completely lit (full moon). As children watch this interactive animation, they have the opportunity to understand and then to predict the different lunar phases depending on the moon’s location. This understanding will allow them to create their own moon phase model showing the different stages of lunar progression. Make sure your students include the earth, sun, and each unique phase of the moon in their model. This can be created either by using Styrofoam balls that have been painted to reflect each stage, or by using a lit model with a small light to represent the sun and a rotating moon that exhibits different levels of shadow depending on its position relative to the earth. This demonstration makes an excellent 5th grade science fair project. 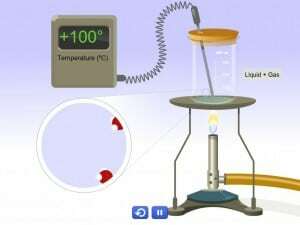 This interactive tool helps students learn about the solid, liquid, and gas forms of water. Since these three phases exist for all matter, it also allows them to learn about these unique characteristics as they apply to the rest of life. The 3 States of Water tool makes an excellent science fair experiment for both lower and upper grades. Lower grades can simply watch the change take place between each state and make observations about the appearance of each. Upper grades can go into more detail. In addition to making observations, they should also conduct timed experiments. These should include heating room temperature water at a constant temperature to see how long it takes to boil and create steam (gas), and freezing room temperature water to see how long it takes to freeze. Have students record their observations at 3 minute intervals for the boiling process and at 20 minute intervals for the freezing process. Students can go on to compare the boiling and freezing temperatures and rates of water to other common elements found on the earth. This experiment also provides the perfect opportunity to discuss Hydrogen bonds since these are what allow water to create floating ice and have a relatively high boiling point. From now you can also teach the children about this topic by using a video to let them understand the 3 States of Water even better! While the classic volcano has always provided an impressive science fair display, you can take this favorite demonstration a step further by using the Volcanism tool. 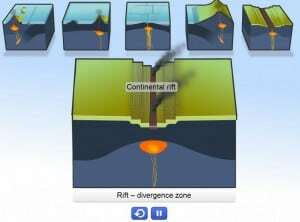 This activity allows students to watch animations of five different types of volcanoes. The unique eruption pattern as well as the formation of each is presented in order for your students to see there is more than one standard type of volcano. Help your children create an in-depth science demonstration that not only includes the eruption, but the processes that must first take place in order for the eruption to occur. This experiment provides a great opportunity to discuss the makeup of the earth’s crust and the details of each unique layer. It also helps students understand the ‘why’ behind a volcanic eruption. Today’s school science fairs are more concerned with scientific observation and understanding than they are with the demonstration. This means that while carefully crafted model volcanoes and their colorful eruptions might look incredible, they are generally no longer considered to be truly scientific. Teach your students about the ‘why’ behind this classic experiment and help them understand one of nature’s most impressive displays. 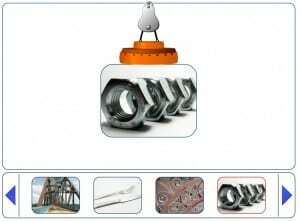 The Magnetism interactive tool gives students a chance to work with magnets to see which items they attract and which they don’t. This experiment works well for a science fair since it has both a research and a demonstration aspect. Being able to show that certain items are magnetic is interesting but being able to explain why those objects are magnetic is what a science fair judge really looks for. Help your children first discover which types of items will attach to a magnet by having them select objects from the bottom of the screen to drag to the picture of the magnet. When they release the object, the will find out if it is magnetic or not. Once they have had the chance to compile a list of items that were attracted, help them discover the characteristics they have in common. They should begin to see that metallic objects or those that have metallic components are the ones that will attach to the magnet. This provides a great opportunity to discuss the characteristics of metals so that students understand the ‘why’ behind the demonstration. It also provides a perfect opportunity to talk about the Periodic Table of the Elements so that children can grasp elementary concepts about the different components that make up our earth. This science fair experiment not only gives students the chance to grow their own plants but also to learn about the role of plants on our planet. Start with the interactive Gynzy tool which shows the steps of a growing plant. 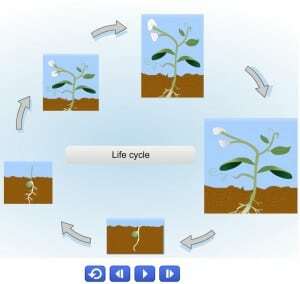 Then have your child or student design an experiment that will demonstrate each step of the life cycle of a plant. Purchase a packet of seeds for a common flower at your local garden store then have your child plant one seed in a cup and provide it with the necessary light and water. Two days later, have your child plant another seed, continue this process every two days until you have four or five different seeds planted. As each seed grows, it will show a different step in the plant’s life cycle. By the time the science fair arrives, your students will have several different samples to show. Teach your students essential plant vocabulary words such as germination, sprouting seed, blossom, and pollination so that they can discuss each step with the judges. This is also a great time to talk to your children about the role that plants play in the environment. Their use of Carbon Dioxide to produce Oxygen is what places that essential gas in our atmosphere so that animals and humans can breathe. The Carbon Dioxide waste product of animal respiration is then recycled by photosynthetic organisms such as plants so that no product is wasted. The Gynzy website provides a variety of other tools and activities that can serve as the basis for your students’ science fair projects. Remember that whichever topic you choose, your child will need to know the reasons behind the process and should be able to explain them to a judge. Since science fairs today want to see the intelligent application of the Scientific Method in your child’s experiment, you need to ensure you are completing more than just a demonstration. Use your science fair as a chance to talk in depth about the scientific principles and concepts that are behind an experiment. The demonstration itself is always interesting but it is the natural laws behind the demonstration that make an experiment truly fascinating. To check whether your student or child is prepared to talk to the judges, ask them questions about what their experiment is, what it is designed to show, what scientific principles are highlighted by their experiment, and what steps they took to conduct it. Their ability to answer these questions will provide them with a new level of scientific understanding and will help them succeed in their science fair.